I’ve been planning to share this recipe for a over a year now, but I kept passing it over in favor of more exciting, more chocolate-y recipes. I mean, how can roasted asparagus compete with recipes like Cocoa Brownies with Browned Butter or Champagne Cream Puffs? But honestly, this is one of my favorite ways to eat vegetables ever. When asparagus season starts each Spring I get almost giddy about roasting some up and stuffing it in my face. This recipe is so simple you’re probably thinking “What’s the big deal? It’s just asparagus.” But oh, roasting does something to asparagus that’s near magical. It somehow intensifies the flavor while bringing out a subtle sweetness. I like to roast mine until the tips are browned and crunchy, which when combined with a little salt makes those beautiful green spears downright addictive! This is one of those recipes where you don’t need to be exact. Use these measurements as a general guideline, but adjust to your taste. Makes a great side dish on its own, but can also be use in other recipes – like quiches! * To stem asparagus, grasp the spear with two hands – one at the base and one near the middle. Gently bend the spear and the woody end should just snap off. Discard woody ends. Cover a baking sheet with foil (for easy clean up). Preheat oven to 400°F. Lay asparagus on the prepared baking sheet. Drizzle with olive oil, sprinkle with salt and toss until evenly coated. Arrange spears in a single layer. 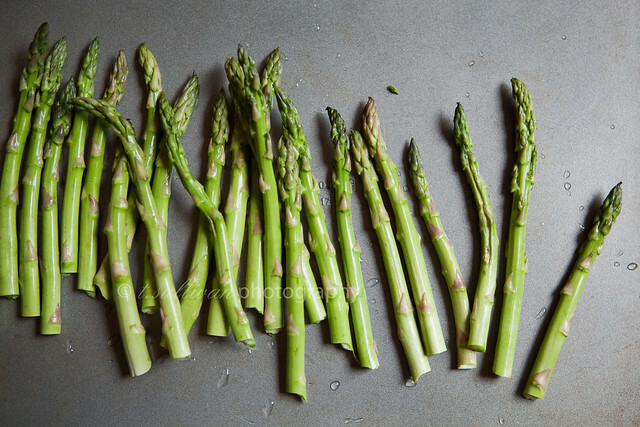 Roast at 400°F for 10-15 minutes for skinny asparagus (15-20 minutes for thicker asparagus), or until tender. We LOVE roasted asparagus. When I can’t be bothered to run the oven at 400 degrees, I roast it in a pan on top of the stove. I love roasted asparagus too!! Once I roasted it with some cardamom seeds, and that was pretty good, but I like it best with just a little lemon juice sprinkled on top. This is how I cook my asparagus, too! Only differences – I use Tony Chachere’s seasoning (a great all-purpose seasoning salt with a bit of spice that I got at Wal-Mart on a whim and love) instead of just salt, and I broil it for a couple minutes at the end to give it a slightly-grilled flavor. One of my favorite meals of all time is lamb with asparagus and red potatoes…. mmm…. I like the idea of broiling it for the last few minutes. I’ll have to try that! P.S. I got some awesome thick asparagus at the local farmer’s market last week. I thought the thickness would make it have a harder texture, but it was just as delicious and tender as the smaller stuff! One of my favorite recipes! So healthy but flavorful too! Looks delicious! 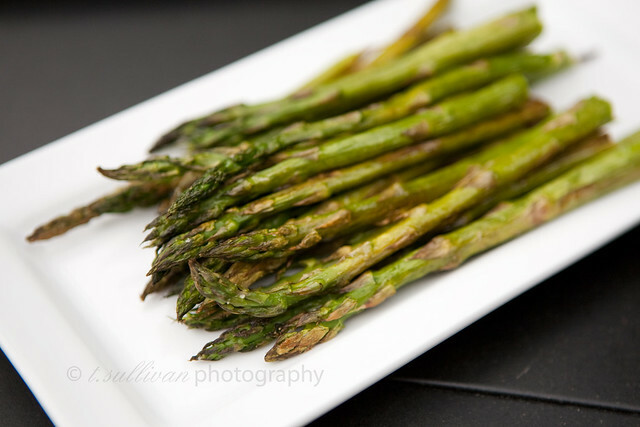 I completely agree–I love roasted asparagus. I actually prefer it to just steaming the vegetable. I often add some lemon juice to the asparagus for a little zing! I just came across your site and am enjoying the recipes and drool-worthy photography. Look forward to following you and cooking through some of your posts. Thank you!